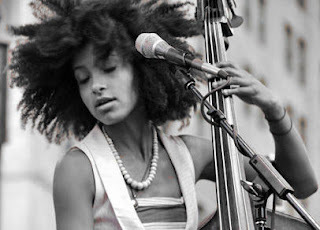 Esperanza Spalding: "All About Me"
Spalding was born and raised on what she calls “the other side of the tracks” in a multi-lingual household and neighborhood in Portland, Oregon. Growing up in a single-parent home amid economically adverse circumstances, she learned early lessons in the meaning of perseverance and moral character from the role model whom she holds in the highest regard to this day – her mother. Berklee College of Music was the place where the pieces all came together and doors started opening. After a move to the opposite coast and three years of accelerated study, she not only earned a B.M., but also signed on as an instructor in 2005 at the age of 20 – an appointment that has made her the youngest faculty member in the history of the college. She was the 2005 recipient of the prestigious Boston Jazz Society scholarship for outstanding musicianship. Soon after release, Esperanza went straight to the top of Billboard’s Contemporary Jazz chart where it remained for over 70 weeks. Spalding was booked on the Late Show with David Letterman, Jimmy Kimmel Live, the CBS Saturday Early Show, the Tavis Smiley Show, Austin City Limits and National Public Radio. Other highlights included two appearances at the White House, a Banana Republic ad campaign, the Jazz Journalists Association’s 2009 Jazz Award for Up and Coming Artist of the Year, the 2009 JazzWeek Award for Record of the Year, and many high profile tour dates, including Central Park SummerStage in New York and the Newport Jazz Festival. 2009 was capped by an invitation from President Obama to perform at both the Nobel Prize Ceremony in Oslo, Norway – where the Nobel Peace Prize is awarded – and also at the Nobel Peace Prize Concert. And as well as being on the road with her own band, Esperanza has toured with Joe Lovano, and has also performed with pianist McCoy Tyner. Esperanza Spalding at the White House: "Overjoyed"
If Esperanza marked a brilliant beginning for this gifted young artist, then Spalding’s August 2010 release, Chamber Music Society, sets her on an upward trajectory to prominence. Inspired by the classical training of her younger years, Spalding has created a modern chamber music group that combines the spontaneity and intrigue of improvisation with sweet and angular string trio arrangements. The result is a sound that weaves the innovative elements of jazz, folk and world music into the enduring foundations of classical chamber music traditions. Co-produced by Esperanza and Gil Goldstein (with string arrangements provided by both), Chamber Music Society finds Esperanza with a diverse assembly of musicians: pianist Leo Genovese, drummer Terri Lyne Carrington, percussionist Quintino Cinalli, guitarist Ricardo Vogt, and vocalists Gretchen Parlato and the legendary Milton Nascimento. The string trio is comprised of violinist Entcho Todorov, violist Lois Martin and cellist David Eggar. Esperanza has presented this album with a number of tours across the USA and Europe, as well as travelling to Japan to play at the Blue Note club in Tokyo and also down to the Cape Town Jazz Festival in South Africa. The album has also been supported with TV appearances on the top American late night chat shows, such as David Letterman and Jay Leno. On Februrary 13th 2011 in Los Angeles, Esperanza received one of the music industry’s most prestigious prizes, the Grammy for Best New Artist. As Esperanza later said, she was surprised and also grateful to receive this award. It had been a very special day, as earlier on Esperanza has cohosted the pre-telecast with Bobby McFerrin and also performed with the Grammy Jazz Ensemble. As well as a very busy spring and summer touring again in Europe and North America, Esperanza has been working on her upcoming new album, Radio Music Society. This new recording which she herself describes as funkier and more update than its predecessor, is planned to be released in the Spring 2012.